Plan vacation or business trip with eTravel.com and take advantage of cheap rates on flights booking, airline tickets, and lowest airfares for Los Angeles. 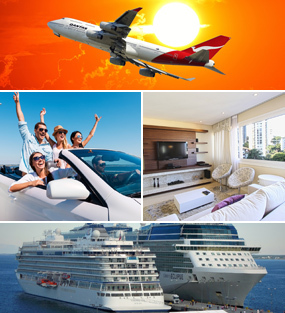 Search cheap flights to Los Angeles, find and book single or multi-city destination flights. On this page we give you information and glimpse of visiting places in Los Angeles, California, United States. Situated in the Southern region of California is the famous city of Los Angeles, the home of Hollywood. Every inch of the city has something amazing to show its visitors, whether it is the Hollywood Boulevard, Paramount Pictures, Warner Brothers or Universal Studios. The city is also filled with beautiful art museums, glorious beaches and peaceful parks. What is the Best Time to Visit Los Angeles? The period from March to May or from September to November is more relaxed and the temperatures absolutely perfect. Even the tourist crowds are smaller during this time in Los Angeles. For exciting deals on your LA trip consider the winter season. But be sure to take an umbrella, because some rainfall is expected during the January – February period. The summer months from June to August are the hottest and also the most crowded, making it the worst time to be in LA. How to Save When on a Los Angeles Tour? Planning is a definite must before coming to Los Angeles. Seek out all the free attractions and find out when is the slack season to get the best deals on flight plans and accommodation in the city. When looking for a place in Los Angeles, keep away from the beaches. The hotel prices along the beach cost way more than anywhere else. Pay a visit to West Hollywood to indulge in affordable shopping at the little boutiques along the streets. The iconic Hollywood Sign is very easily recognized the world over as a symbol of Los Angeles. Built in 1923 as a gigantic advertisement for a housing construction project that never took off, the sign symbolically represents everything Los Angeles stands for – entertainment, tourism, and prosperity. A highly popular theme park, it is a world famous studio incorporating various movie studios, specially conducted tours, various enchanting tourist attractions, plenty of amusement rides, restaurants offering superb cuisine, and much more. One can enjoy a behind-the-scenes look at how special effects and techniques are used in movies. The visitors can participate and find out what life's really like in a movie back lot. The Universal Studios is beyond any doubts a "must see" tourist attraction. An amusement park featuring Walt Disney’s world famous characters, the Mickey Mouse, Donald Duck, and Goofy, the park offers many rides and attractions. It takes more than a day to really enjoy what the park has to offer. A great entertainment venue not just for kids but adults alike, there’s a lot you can do in Disneyland. The domes of Griffith Observatory are a popular tourist destination. Apart from the breath taking view, the Observatory is also a great place to view the Hollywood Sign and the entire Los Angeles area below. Since the admission to the observatory is almost free, it’s a highly visited tourist spot in Los Angeles. The observatory presents many exhibitions including "The Big Picture" which is an image of Virgo cluster of galaxies. LA has so many tourist attractions and popular visiting spots that it’s almost impossible to mention all of them in a nutshell. Other attractions in and around Los Angeles are the Knott's Berry Farm, Venice Beach Boardwalk, Rodeo Drive, Hollywood Walk of Fame, Sunset Strip, The Queen Mary, Santa Monica Pier, The Original Farmers Market, Los Angeles County Museum of Art, and the Beverly Center to name a few.